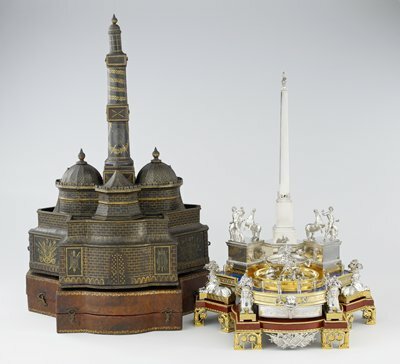 This ingeniously complex inkstand may have been presented to Pope Pius VI to commemorate completion, in 1786, of the Quirinal Monument in Rome, just across from the pope’s summer palace. As seen in the inkstand, the monument incorporates an Egyptian obelisk, which was unearthed about a mile away, and two ancient Roman sculptures of horse tamers. The horse tamers on the inkstand swing out with the press of a lever, revealing an inkwell and sander (a shaker for sprinkling fine sand or powdered talc over wet ink to speed its drying). The sphinxes’ headdresses conceal candleholders, and the center drawer contains an assortment of illusionistic engravings, including Coaci’s trade card. The two doves can be made to kiss by means of a lever located under the fountain.